Hope everyone is enjoying this sunshine we have been getting !! I thought what a better way to spend this good weather than getting a workout in, anyone else? (Sunshine improves mood, bone health, immune system, sleep, clears skin & promotes weight loss). My friend and I took it to the track today (our old highschool, yikes) and burned 500 cals (!!!!) with this QUICK 40 minute workout. It was bomb. Sprints are what really did us good. Sprinting is THE best way to get rid of excess fat, like it’s incredible how fast sprint intervals can tighten up your body. &&& you can do sprints anywhere! It was super ideal at the track of course. We sprinted the straight aways and walked the round-a-bout totaling half of a mile & the rest of the time we spent on the stairs & got super creative here (watch the video below for all the details). 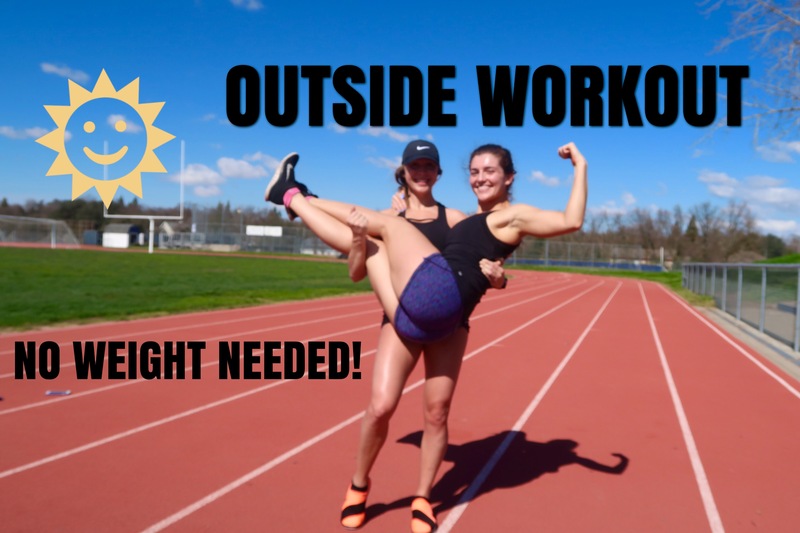 I want to share with you guys the workout we did so you can feel just as fabulous! Maybe try this one tommorw? Or now? This workout helped us burn 500 calories– is that not insane? It was so much fun too becuase it was outside!! Follow along on this video & give it a try . As always, let me know how it goes!! !